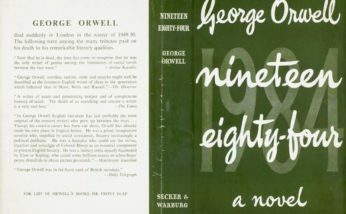 Foundation Director Professor Jean Seaton will be at The Bath Festival 23rd May to discuss the legacy of Orwell’s classic novel, Nineteen Eighty-Four. Doublethink, Newspeak and The Thought Police: do we live in the world that Orwell predicted? Considering the book’s powerful cultural and political relevance 70 years after publication alongside Jean are journalist and author Dorian Lynskey (The Ministry of Truth: The Biography of George Orwell’s 1984) and Observer associate editor Robert McCrum They talk to James Long. Dorian Lynskey is a music writer for the Guardian and Observer as well as magazines including Q, GQ and Mojo. Robert McCrum was born and educated in Cambridge. For nearly 20 years he was editor-in-chief of the publishers Faber & Faber, and then literary editor of the Observer from 1996 to 2008. He is now an associate editor of the Observer. He is the author of Every Third Thought, My Year Off, Wodehouse: A Life (2004), six novels, and the co-author of the international bestseller, The Story of English (1986). Jean Seaton is Professor of Media History at the University of Westminster and the Official Historian of the BBC. Jean became Director of The Orwell Foundation (then, The Orwell Prize) in 2007, taking over from Sir Bernard Crick. Under her stewardship the prize has become Britain’s premier prize for political writing, celebrating honest writing and reporting, confronting uncomfortable truths and uncovering hidden voices. She is the author of Carnage and the Media: the Making and Breaking of News about Violence (Penguin, 2005), with James Curran, Power without Responsibility: the Press and Broadcasting in Britain (8th edition, 2014) and Pinkoes and Traitors: the BBC and the nation, 1974-1987 (2015), serves on the board of the journal The Political Quarterly and is a founding member of several active media NGOs, including Full Fact and the Reuters Institute. She broadcasts regularly on historical, political and cultural matters, including Orwell and his legacy. This event is organised by The Bath Festival 2019. The link below will take you to an external site: The Orwell Foundation bears no responsibility for the accuracy, legality or content of the external site or for that of subsequent links. For enquiries relating to the event, please contact The Bath Festival directly.